There is good news for Texas school children who start their day off with a school breakfast, according to the Texas School Breakfast Report Card produced by Baylor University’s Texas Hunger Initiative. Thanks in part to the passage in 2013 of Texas Senate Bill 376 – the “Universal Breakfast Bill” – and the implementation of alternative service models, Texas has become a national leader in school breakfast participation, moving up to 10th in the state rankings. 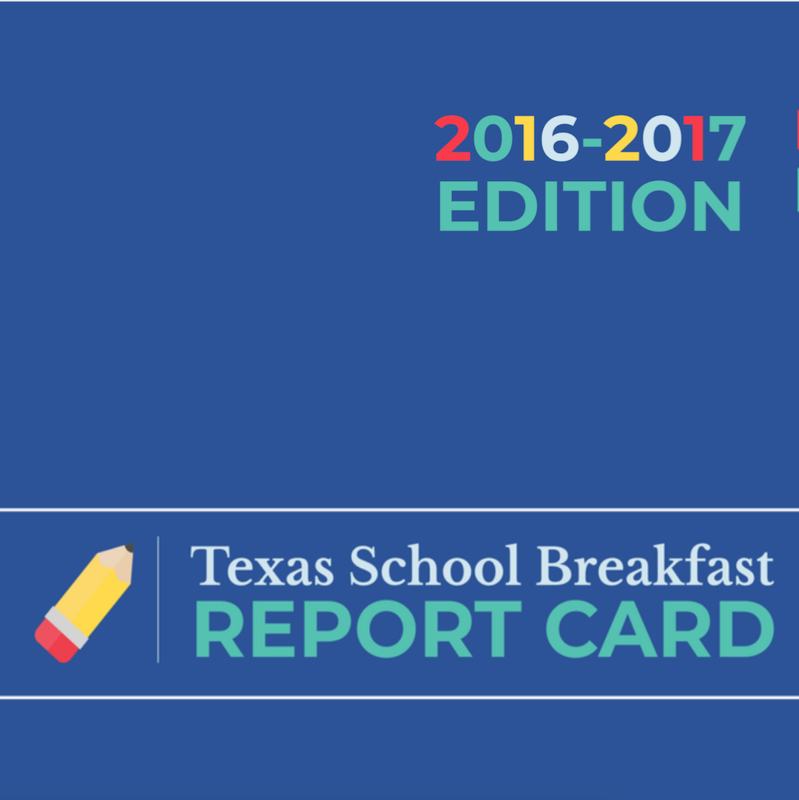 Released to cap off National School Breakfast Week, the 2016-2017 edition of the Texas School Breakfast Report Card captures breakfast participation data for Texas counties and more than 1,000 school districts. The report continues to be a powerful example of how data can be used to fight hunger. What is the Texas School Breakfast Report Card? Now in its fourth edition, the Texas School Breakfast Report Card provides an overview of the school breakfast program, the benefits of school breakfast, creative models for serving breakfast and proven success strategies. This edition looks back at breakfast participation over the last several years, highlighting successes and opportunities to increase participation over the next few years. It also compares 2016-2017 school breakfast participation to 2013-2014 participation and shows the potential for growth, both in number of students served and reimbursements gained, if each Texas school district had a 70 percent benchmark, a national goal set by the Food Research and Action Center (FRAC). According to the USDA Food and Nutrition Service, 314 million breakfasts were served in Texas schools in 2016-2017, which led to a $558 million reimbursement for Texas schools. Recent empirical studies published in Frontiers in Human Neuroscience and AMA Pediatrics and conducted by Sodexo Foundation, FRAC and No Kid Hungry continue to show the role school breakfast can play in improving nutrient intake, increasing attendance and improving test scores among students. A 2011 research study published in the Journal of Nutrition suggests that state policies requiring school breakfast reduces food insecurity among elementary students. For more information on the Texas Hunger Initiative’s work and to read the full Texas School Breakfast Report Card, visit texashunger.org. The Texas Hunger Initiative (THI) at Baylor University is a capacity-building and collaborative project, which develops and implements strategies to end hunger through policy, education, research, community organizing and community development. THI works to make the state food secure by ensuring that every individual has access to three healthy meals a day, seven days a week. THI convenes federal, state and local government stakeholders with non-profits, faith communities and business leaders to create an efficient system of accountability that increases food security in Texas. THI’s work to increase participation in school breakfast programs is supported by No Kid Hungry. Along with its office located within the Diana R. Garland School of Social Work at Baylor, THI has offices located in Austin, Dallas, El Paso, Houston, Lubbock, McAllen and San Angelo.